Pastel colors are happy hues. What better way to honor the blooms of spring than coming out with a palette of pastel-colored products. PQI has taken note of this cue with its “Springtime Afternoon Tea” release of Macaroon USB flash drives. PQI‘s new range of drives not only keeps spring in mind, but also those sweet little French confectionaries known as macaroons. Staring at these flash drives might give you the urge to indulge in a bit of afternoon tea. PQI’s Macaroon flash drives come in pastel versions of the colors blue, pink, purple, and yellow. The flash drive is a rather inconspicuous one. Thanks to PQI’s Chip-On-Board (COB) technology, the form factor stays slim, small, and light. 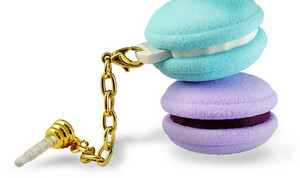 And despite giving off a generally cutesy vibe, the Macaroon USB flash drives are water-, dust-, shock-, and impact-resistant. Unfortunately, for our sweet tooth, real deal macaroons don’t have the same kind of durability. The flash drive’s design is unique in that the macaroon-shaped part of the drive functions as the cap. It’s where you keep the drive inserted when you’re stowing away the Macaroon drive for transport or storage. The flash drive even comes with a lanyard chain that turns the drive into an ornament for your phone, if you choose to attach it, or a headphone accessory. The chain ends into a 3.5mm earphone jack plug that serves as a protector. Plug the lanyard into a vacant headphone jack, and you don’t have to worry about the insides of your jack getting dirty from exposure to the elements. The PQI Macaroon USB flash drives offer a lighthearted break from the ever dominant trend of serious and sleek gadget designs popular with electronics. After all, it is seems likely unfeasible to associate macaroons with USB flash drives. PQI’s release of its new, pastel “Springtime Afternoon Tea” release shows that it’s alright to come out of the “serious” woodwork once in a while. And with 8 GB, these Macaroon drives are not so bad in terms of storage. They make a great accessory for consumers who don’t work with large files on a daily basis and wants to have a little fun to boot. This entry was posted in Custom Shaped USBs, PQI and tagged custom shape, Macaroon, Novelty USB Drive, PQI, USB drive. Bookmark the permalink.